The Gadsden Flag was created by South Carolina Congressman Christopher Gadsden for the first Commander-in-Chief of the United States Navy, Esek Hopkins. The yellow flag with a rattlesnake and the words "Don't Tread On Me," was flown by Hopkins from his flagship the USS Alfred and hoisted by Revolutionary War hero John Paul Jones. It was also the first flag of the United States Marines. In 1754, during the French and Indian War, the colonies sent representatives to Albany, New York to discuss their joint defense. At this meeting, called the Albany Congress, Ben Franklin presented a plan to unite the colonies. He published America's first political cartoon in support of the plan. The cartoon had a snake cut up into 8 pieces, each representing different colonies. 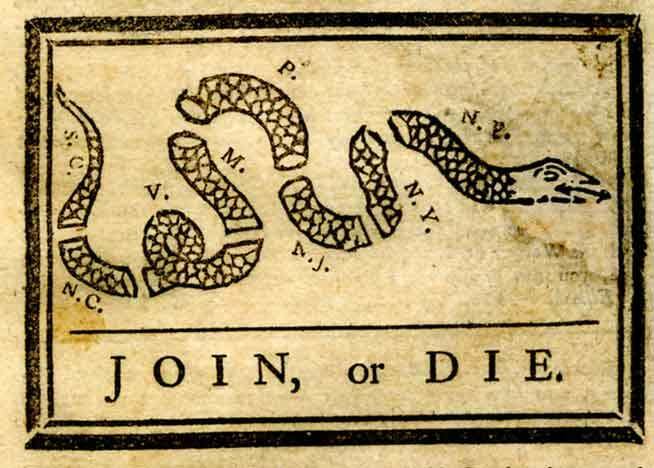 Underneath the snake were the words "Join or Die." It played off a common superstition at the time, that a snake cut in pieces would come back to life if you put the pieces back together before sunset. The meaning of the cartoon was that the colonies must unite and work together to defend themselves against the French and their Indian allies. Otherwise, if they stayed disjointed, they would be defeated. Franklin's plan was not accepted at that time, but it was the first call for the colonies to unite, 20 years before the American Revolution. The snake cartoon in various forms was reprinted all over the colonies. Over the next 20 years, the snake became more and more identified as a symbol of American unity. Its use saw a resurgence in 1765 when the common enemy was the Stamp Act, passed by Parliament to raise money to pay off the great debt incurred during the French and Indian War. Eventually the snake made its way onto flags, money, uniforms and other items. In 1774, the snake fighting a British dragon was added to the masthead of the Massachusetts Spy, New England's largest newspaper. The paper was owned by Isaiah Thomas and the engraving was done by Paul Revere. It is not known when or by whom the phrase "Dont Tread On Me" was first associated with the snake. "I recollected that her eye excelled in brightness, that of any other animal, and that she has no eye-lids - She may therefore be esteemed an emblem of vigilance. -- She never begins an attack, nor, when once engaged, ever surrenders: She is therefore an emblem of magnanimity and true courage. -- As if anxious to prevent all pretensions of quarreling with her, the weapons with which nature has furnished her, she conceals in the roof of her mouth, so that, to those who are unacquainted with her, she appears to be a most defenseless animal; and even when those weapons are shewn and extended for her defense, they appear weak and contemptible; but their wounds however small, are decisive and fatal: -- Conscious of this, she never wounds till she has generously given notice, even to her enemy, and cautioned him against the danger of stepping on her. -- Was I wrong, Sir, in thinking this a strong picture of the temper and conduct of America?" Read the complete article from Benjamin Franklin in the December 7, 1775 Pennsylvania Gazette, The Rattlesnake as a Symbol of America, here. 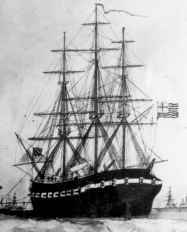 In the fall of 1775, a ship called the Black Prince, which was partly owned by Robert Morris, who was a member of Congress from Pennsylvania and a future signer of the Declaration of Independence, arrived in Philadelphia from England carrying private letters for the Continental Congress warning that the British were planning to send two ships loaded with arms and gunpowder to reinforce the British troops already in the colonies. Congress decided to create a navy to respond to the British warships; to harass them, stop them from harassing American merchant ships, capture their military cargo and the ships themselves if possible. They authorized the creation of 5 companies of marines and purchased several merchant ships, which were reoutfitted for battle. One of the ships they purchased was Morris' Black Prince, which they renamed the USS Alfred. Morris sat on Congress' Marine Committee, which oversaw the creation of the navy. The first marines were drawn up in Philadelphia and, according to Franklin's "An American Guesser" essay above, some of them carried drums painted yellow with the rattlesnake on them and the words "Don't Tread On Me." 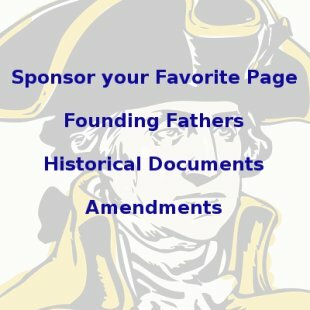 Another member of the Marine Committee was Congressman Christopher Gadsden of South Carolina. Gadsden was a leader of the Sons of Liberty in South Carolina and became a general of the South Carolina militia. He was sent to Congress in Philadelphia by the South Carolina Provincial Congress. In keeping with European tradition that the commander of a navy fleet would have his own personal standard, separate from the flag of the nation, Gadsden created a flag for Commodore Esek Hopkins, the first Commander-in-Chief of the US Navy. Gadsden may or may not have seen the yellow drums carried by the marines, but he used this same design in creating Commodore Hopkins' flag. Named after it's maker, it has become known as the Gadsden Flag. Due to its association with Esek Hopkins, it is sometimes also called the Hopkins Flag. The Gadsden Flag would have flown from the mainmast of the USS Alfred, the flagship of the fleet and was probably hoisted by John Paul Jones, who was then 1st lieutenant on the ship. He would later become a celebrated captain and hero of the Revolutionary War. Jones raised the Gadsden Flag as Commodore Hopkins' personal standard. This identified which ship the Commander was aboard. He likely also raised the Grand Union Flag as the first official flag of the United States, since the 13 star flag was not adopted until June, 1776. Along with these flags, Commodore Hopkins issued orders to the other ships that included a battle signal flag known as the First Navy Jack Flag, a variation of the Gadsden Flag. The US Navy's first mission took them to the Bahamas to capture British ammunition and gunpowder stored there. Commodore Hopkins with his sailors and marines captured Fort Nassau at the Battle of Nassau in a bloodless victory. This means the first flag carried into battle by the United States Marines and the first amphibious assault conducted by the US Navy were both carried out under the Gadsden Flag. The Gadsden Flag's symbols became well known and were repeated often on various flags throughout the Revolutionary War. 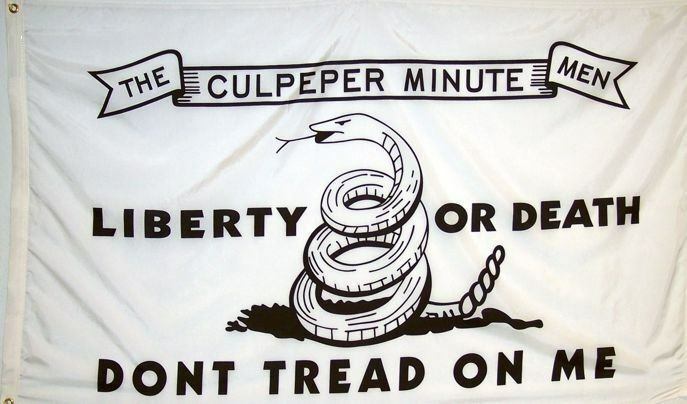 It appeared on another famous flag called the Culpeper Flag, which was first carried by the Culpeper County, Virginia Minutemen when they marched on Williamsburg after Governor Dunmore confiscated the colonists' gunpowder and ammunition and when they fought with him at the Battle of Great Bridge. 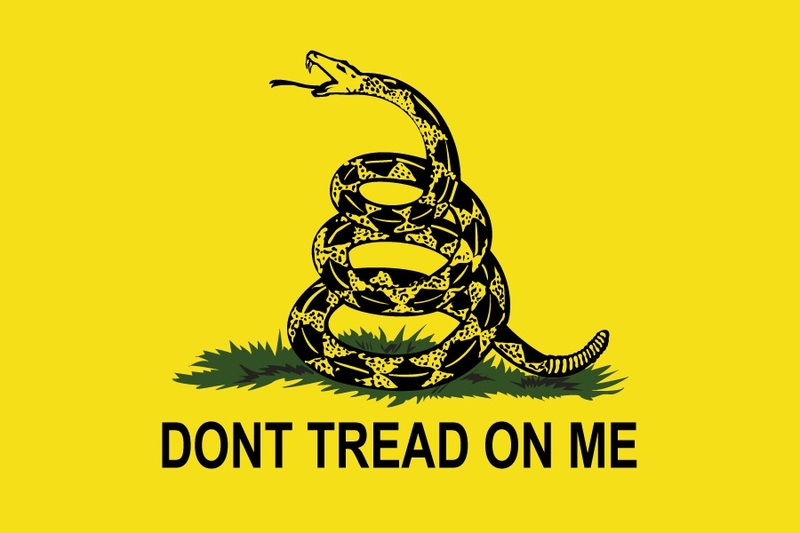 "Col. Gadsden presented to the Congress an elegant standard, such as is to be used by the commander in chief of the American navy; being a yellow field, with a lively representation of a rattle-snake in the middle in the attitude of going to strike and these words underneath, "Don't Tread on Me!" The Gadsden Flag has become a popular sign for Americans expressing dissent toward government policies. In particular, it has seen a resurgence with what has become known as the "Tea Party" movement in the United States. The Tea Party movement is a grassroots movement that believes the US government is overtaxing and overregulating the American people and has grown beyond the size and scope given in the US Constitution. Tea Party activists often carry the Gadsden Flag or wear clothes bearing its imagery. 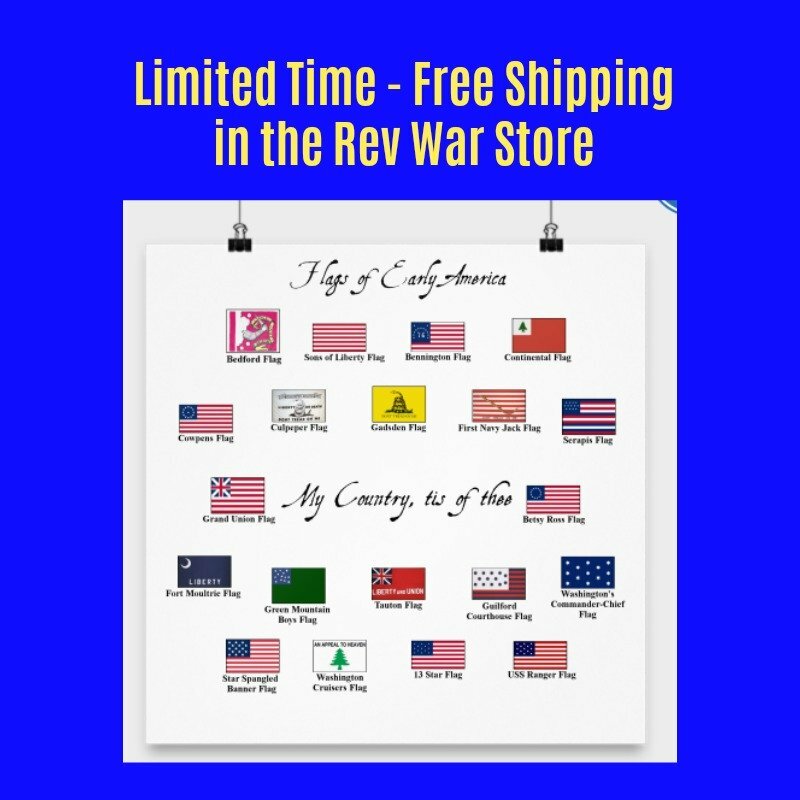 Order your very own Gadsden Flag here and help support this website with your purchase.